Pro Lifers, Please Read This! The most powerful thing you can do to improve politics in Minnesota is to support ranked voting. Find out how ranked voting can reduce polarization, increase participation, encourage more choices, and turn the focus from divisive issues to real solutions. Voters’ Rights. Helping my campaign is easy, fun, surprising, and rewarding. See how by clicking here. Reduce the power of money in politics with an oath of good citizenship. 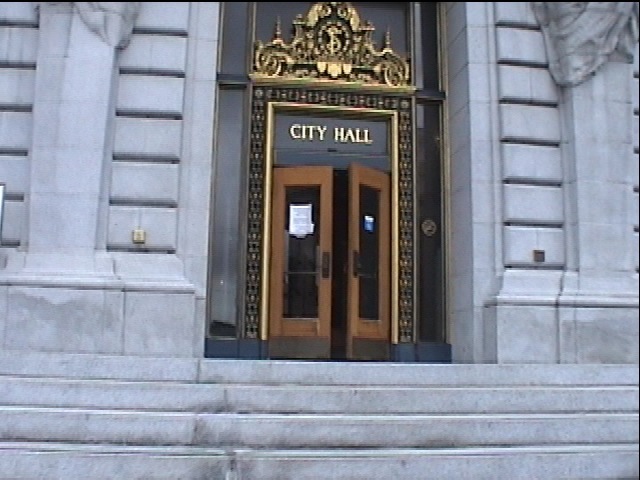 Travelogue video of my trip to San Francisco to observe the ranked choice voting this year. The event was sponsored by FairVote. We attended pollworker training; met with ranked vote activists and political leaders who were involved in its passage; heard discussions by members of the Elections Commission and academics who studied last year's election; met with city election officials and toured their facility; went precinct to precinct to talk to voters and pollworkers; and had fun in the city. The video only touches a little of all that, and to compress it, a lot of the quality is lost. But you may find it interesting and amusing. Seven minutes long. I'm not a masochist, but the idea of being abolished really appeals to me. Being laid off, fired, or let go just doesn't have the same ring as being abolished. Anyway, it makes sense to abolish the office of Secretary of State. That was the recommendation of the Minnesota Constitutional Study Commission, back in 1973. This commission was composed of 21 of the great names in Minnesota public life and was led by former governors Elmer Andersen and Karl Rolvaag and future judge Diana Murphy. Besides the Secretary of State, the commission recommended eliminating the office of State Auditor. These were not new ideas: the same suggestions came from the Constitutional Commission of 1948, Governor’s Council on Executive Reorganization of 1968, and the Minnesota Efficiency in Government Commission of 1968. The present system of a divided executive authority which we have in Minnesota and which is common to nearly all of our states grew out of our early experience with the English colonial system. When the states were established after the Revolutionary War, there was a strong desire to have as weak an executive system in each of the states as possible in order to prevent the same arbitrary and capricious use of power which the colonists had experienced under the British regime. The general theory of government at that time was to provide that each executive function be performed by a person who was elected by all of the people of the state. Whatever had been the merits of this system in the past, it seems to the committee that in our modern world we cannot operate state government with a divided executive System...Generally, the committee feels that the executive branch of state government should have one, clearly identifiable head. In order that the governor may be truly responsible to the people for the actions of the executive branch, he must have the power to appoint all officials for whom he is responsible. Good management, efficiency and responsiveness can allow no exceptions to this general rule. Presently, the responsibilities of the secretary of state are primarily of a bookkeeping and record-filing nature. Voter judgment is all too often based on name identification or return to office of a long-time incumbent. The committee would venture to guess that the average voter does not really know what responsibilities are carried out by the secretary of state. The committee is confident that the present responsibilities of the office could be adequately handled without electing an officer to such a position. After the commission report, bills were introduced to implement these recommendations through constitutional amendments. But they never got any political traction. Then, in the 1985-86 biennium, the Senate approved an amendment which would combine the Auditor, Secretary of State, and Treasurer into an elected State Comptroller. But the House responded by proposing to eliminate only the Treasurer. This was eventually done in 1998, but the Secretary and the Auditor remain. The Secretary of State has many administrative duties relating to business and corporate filings which could easily be re-assigned to the governor. The Secretary is also the chief administrator of elections. Due to the debacle of Florida in 2000, many citizens have become aware that the Secretary of State has too much discretion in election matters for someone who is elected in a partisan manner. The chief election administrator needs to be appointed in a non-partisan way. This could be done by the Judicial Merit Selection Commission or some similar body. There are other options, but the bottom line is that the appointee should be someone perceived to be competent and unpolitical. Compared to other countries, we have too many elections and elect too many offices. Better to focus on our chief executive and the legislature, then hold them accountable for good performance. So don't hold back--elect me, then abolish me. I promise to cooperate provided the process to appoint the chief election administrator is fair and nonpartisan. Given the choice, most people would want the administrator of elections to be someone who shares their political views. But you will probably only successfully elect such a person 50% of the time or less. Why chance it? In the past, the Secretary of State’s office has had a low profile. But recently, the office has gotten more attention, particularly because of close presidential elections. In both swing states Florida (2000) and Ohio (2004), the Secretaries were also the state campaign managers of President Bush. Many people feel the actions of these Secretaries influenced the result. This does not inspire confidence in the integrity of elections. In response, leaders of both parties organized to try harder to win the Secretary of State races. It evidently didn't occur to them to reduce the partisanship instead of pump it up. Throughout Minnesota, local election officials are either appointed or elected in a nonpartisan way. It is time to do the same for the Secretary of State.